Some 15 people have been detained after violent clashes broke out in the middle of a football match in the Russian city of Tula, where fans of Torpedo Moscow broke the fence of the ‘away’ sector and attacked the supporters of FC Arsenal Tula. Around half an hour into the first half of game, the match was stopped and riot police had to quell the fans from opposing sides clashing with each other. The fighting started when Moscow fans began throwing fireworks and pelting Tula’s fan sector in the stadium, according to the head of security of Russia’s Premier League, Aleksandr Meitin. Tula fans started chanting offensive slogans towards the visiting Moscow team, provoking Torpedo fans to tear off the fence of the ‘away’ sector and attack supporters of Arsenal. Fans were met by riot police, who “normalized” the tensions quickly. While police report no injuries, social media claim a few fans have been hurt. After a brief five minute interruption, players returned on the field to finish the match, which Moscow won 3-1. 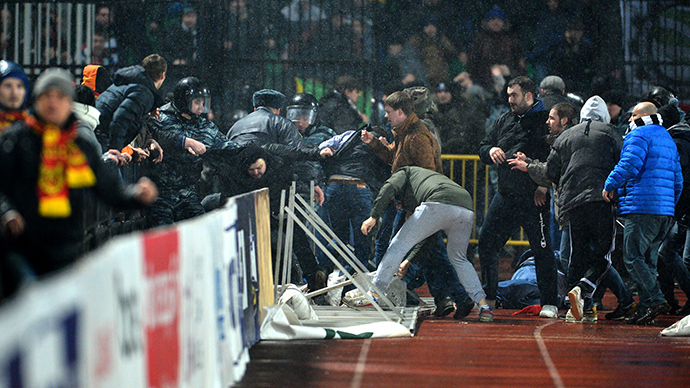 The Russian Premier League announced that it might introduce sanctions against Moscow Torpedo fans and fine the club. At the same time the league praised the police’s conduct for quickly defusing the tensions. The instigators of disturbances were detained, authorities confirmed, saying that overall some 15 people were escorted to the police station.